Visual Paradox: Frequently asked Questions - What software do you use? Here are some of the tools I use to create my imagery. If you are interested in creating your own I can't recommend them high enough. You can read more about each one by clicking on the names below. Please remember my site, and these links, when you decide to purchase your own. Your support is greatly appreciated. Vue is widely used by artists around the world because it provides that perfect balance between a rich feature set and unmatched ease of use. A compelling combination of 2D image editing benefits. Gain the freedom to experiment more easily, powerful color management features, broad workflow, automation, and precision in selecting and measuring. Whether you're a pro or beginner 3D artist, Bryce is the easiest way to create, explore and animate extraordinary imagery. A work-in-progress scenery generator for Windows and the Mac OS, that generates beautiful landscapes. Poser is a 3D figure animation and reference tool for digital artists and animators. The unique and powerful 3D feature set is easy for anyone to master. 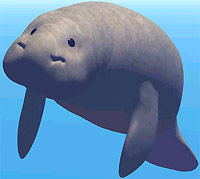 A baby manatee I made with Amorphium. A free 3D figure animation posing tool for use in positioning "Poser" format models bought from DAZ.